Auburn played its sloppiest game of the year, couldn’t hold on to the ball, couldn’t rebound on either end of the floor, and nearly took a victory at the Pete Maravich Assembly Center over #16 LSU. Instead, the good Tigers squandered a 16-point first half lead and lost 83-78 for another frustrating road loss in the SEC. 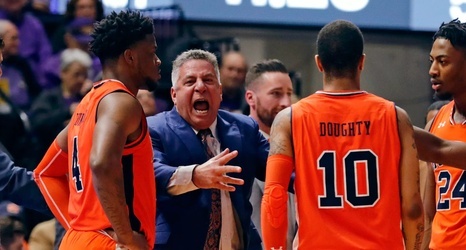 Auburn shot 48% from the floor and hit 16-38 three-pointers, but LSU forced 19 turnovers and scored 31 points off of those turnovers as they kept the Tigers at arm’s length through the second half. The Bayou Bengals also out-rebounded Auburn 47-35, and dominated the second-chance points 29-1.